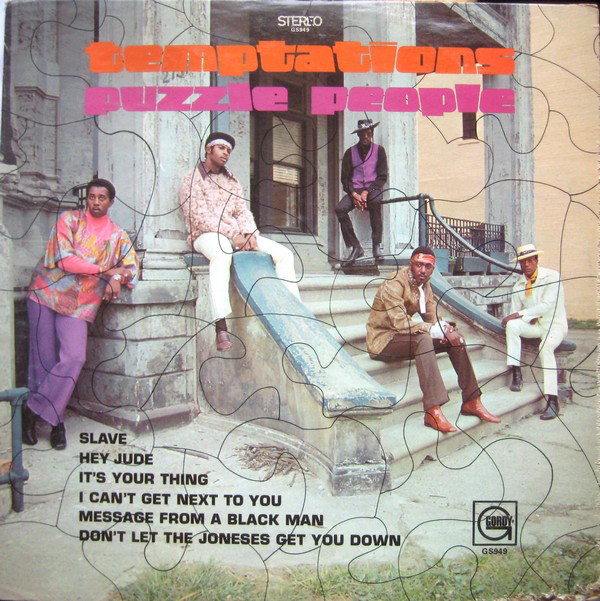 After the seismic "side one" of the "Cloud Nine" album, which saw the beginnings of Norman Whitfield-produced "psychedelic soul", this album came along later in the same year. It was another captivating music of socially aware funky soul and classic, emotional Motown soul. The opener, "I Can't Get Next To You" has a super intro in the opening door and "wait a minute" vocal before it kicks into a magnificent piece of lively, funky, punchy Motown pop. I'm not often a fan of covers of The Beatles' "Hey Jude" but this buzzy, guitar driven, funkily soulful one is actually quite quirkily appealing. Talking of funk, "Don't Let The Joneses Get You Down" is a thumping slice of psychedelic soul/funk - muscular bass drums and excellent trade-off vocals. The big "message" song on the album is the now iconic "Message From A Black Man". "No matter how hard you try you can't stop me now...." and "...yes, your skin is white, does that make you right...." are prime examples of the hard-hitting, ground-breaking nature of this titanic song. The vocal/percussion face-off at the end is so powerful. "It's Your Thing" is a hot funky burner led by some searing buzzsaw guitar . Written by The Isley Brothers it demonstrates just how funky The Temptations had now become. Those wonderful, soulful love songs were still here, but there was also some seriously cookin' funk. Covers were still popping up every now and again, however, too. Roger Miller's "Little Green Apples" had also been covered by the Four Tops and if it sat somewhat incongruously on their album, it did so even more here, despite Paul Williams' excellent, powerful vocal. 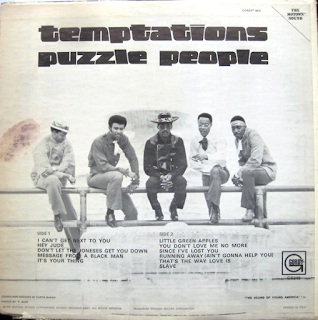 Three classic pieces of melodic, catchy Temptations soul are up next in "You Don't Love Me No More" with its stunning wah-wah guitar intro, the irresistible "Since I've Lost You" and the rhythmic "Running Away (Ain't Gonna Help You)". I remember first hearing these three cuts on a seventies "Motown Special" Temptations compilation and loving them, so they have great memories for me. "That's The Way Love Is" is a catchy, soulful mid-paced number and "Slave" is the final "aware" number, a moving, pulsating piece of funky soul about prison life. It has a great rhythm and owes a bit to Sam Cooke's "Chain Gang" in its "ooh-ahh" vocal backing. It is full of fuzztone and wah-wah too. A powerful end to another mighty album from Motown's finest group, for me.